Sand slipping through my patient’s hand, is how I often think about ideas which we discuss, but for powerful unconscious reasons, never seem to materialize into action. Or, as my colleague says, “people pay us money, not to take our advice.” The key here is to penetrate the patient’s brain, so the new way of seeing the world, is not merely cognitive, but also visceral. Without this visceral component, people tend to relapse into their old habits, their old defenses. Milly, for example, thirty-six, continually has relationships which ultimately make her feel used and worthless. All of the men in her life have ended their relationship by having an affair, which upon revelation, was lasting for most of their time together. This pattern, Milly sees, is a result of her not acting on her deep suspicion that the men she chooses to be with, are disloyal and sensing Milly’s desperation for a relationship. Although she understands this dynamic, she feels powerless to change it. We discuss the repetition in her mates, and how it reminds her of how she was treated by her mother, dismissed and overlooked. Yet, to her frustration, she continues this pattern. “You must need to continue this routine, perhaps with the wish that you will finally get a better outcome.” I say, highlighting that within the repetition is a wish. Milly begins to see that if the wish were more conscious, then she could see that instead of wishing that these men would take a different course, it is she who has to change. Still, even with that insight, the pattern continues. The depth of her initial pain lives on in the persistent repetition. As we spiral inside her unconscious, there is hope for relief from that pain, freeing her to use better judgment for her suitor. The deeper we go, the more likely it is that Milly will break the cycle of degradation. Decision Making: What’s Your Style? Martha, forty-one, always allows her husband to make their major life decisions: what house to buy, where to send the kids to school, how to incorporate religion into raising their children. For years, working with Martha has made me reflect on this sense of deference. Is it respect for her husband? Is it a lack of faith in her own decision-making ability? is it fear of confrontation? Of course, these are not exclusive and so at different times, different factors may be at play. Consciously, Martha is not aware that she defers to her husband. Her narrative is that they have thought things through together, but upon deeper exploration, it is clear that her husband always steers the family ship. Suddenly, Martha, unrelated to our present discussion states “how do I know what is the right thing to do?” The moment of clarity arrived. Deep insecurity and a lack of trust in her ego, not believing in her sense of right and wrong, has led to a marriage in which she is the more passive participant. Sometimes these marriages work well, but Martha is now suffering from questioning why she cannot form her own opinion. Forming opinions, thinking, deciding, are actions that many of us take for granted because we have to navigate through life. Yet, Martha is now in a period of reflection where she is confused as to why she is never certain, or even reasonably sure, so that she can then decide what is best for herself, and what is best for her children. She is no longer comfortable being passive, but nor is she content with offering an alternative point of view. She is stuck by the constraints of her ego which, at this moment, is unable to guide her towards changing her life. Her paralysis is painful as she does not want to stay the same, and yet, she is frightened to change her interface with the world. This is our work together-building a sense of self that can go forward with her own decisions, and not be inhibited by the overwhelming fear of making a mistake. A strong self knows that bad decisions will be made, but that the “self” can then make another decision which will put the person back on track. In other words, the stronger person can see the arc which includes both good and bad decisions, and with the ability to reflect, a better course can come out of wrong turn. The more vulnerable ego stays in place, so as not to experience regret. Accepting regret is personal growth. Martha and I are working on this big picture, the picture of building a new self, a new brain, which steers her in a way where she can feel proud. Liz, fifty-six, recently suffered from her thirty-year husband’s infidelity, and subsequent divorce. She is devastated and shocked to see her “perfect marriage” end this way. Her friends, by contrast, always saw her husband as self-centered, and “not good to her,” as she reported to me, what her friends reported to her. Liz’s apparent denial of her husband’s character served her well for decades. Even though Al, her husband, was often away on business for long stretches of time, she believed that her marriage was the best thing in her life. Al would come home, spend little time with her, devoting most of his home time to his hobbies, she still managed to convince herself that Al was devoted to her. Liz can see some of her denial, in retrospect, but at the same time, she still wonders how she missed the clues. When his latest (she now believes he had many) affair was disclosed, Al had been with Eleanor for ten years. Now, Al and Eleanor are getting married, and Liz is flattened. Some days, Liz comes in to say “it is all because I am thirty pounds overweight,” as if the entirety of their marriage can be reduced to one, rather superficial issue. The need to avoid complexity comes out strongly under stress. Liz’s pressure to summarize her thirty-year marriage, in a tweet, is painful. I gently remind her that there are probably a lot of psychological factors at play, in a relationship which spanned decades and now leaves you feeling painfully confused. She agrees, but she cannot hold on to that thought for too long. Like sand grains running through fingers, she quickly loses traction and returns to her platitudes. This grinding repetition of the complexity of the human mind is what psychoanalysts call “working through.” This is the process where the mill has to keep turning in order to penetrate to the deeper levels of consciousness. The work is long and hard and intense, but without the work, the obstacles to psychological growth grab on tight. Oscar Grant was shot in the back by a BART officer in the early hours of January 1, 2009. The shooting was documented by cell phones, giving us vivid details of a horrifying event. The movie starts there and works backwards by one day, showing us how Mr. Grant lived and loved his girlfriend, his daughter, his mother, his brother and his sister. We see him trying to please these people in his life, while at the same time, struggling to survive, with little financial resources, and seemingly little tenacity to hold down a steady job. As I watched the film, I felt manipulated, rather than seduced. His ending was tragic, as was his life. With my oedipal lens, I sensed that Ryan Coogler, the writer and director, wanted the audience to feel that because of his strong attachment to his mother, he was trying to turn his life around. There is one scene which almost captured this deep motivation, but it failed. The character of Oscar felt conflicted by his relationship with his mom, but this conflict was poorly illustrated, leaving me, the audience member, to feel shallow, hardly connected with Oscar. Consequently, and in sharp contrast to “The Way, Way Back” I did not care about the main character, even though at the same time, I wanted to care. I wanted that feeling in which I was outraged that this man’s life was cut short, leaving a turn-around story unfinished. Instead, I felt nothing. 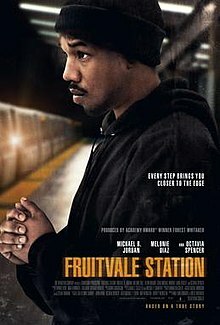 So, I conclude, as the title of this post suggests, ‘Fruitvale’ was fruitless. Today’s LA Times warmed my heart. So much of the time, on this blog, I complain that psychiatrists are not doing enough to protest the poor treatment of the mentally ill. So, today when I read about psychiatrists protesting about patient care, I was relieved and proud. The psychiatrists are speaking out, leaving me to wonder why Steve Lopez, in his series of articles on the mentally ill, never mentions psychiatrists. I also learned from this article that the Department of Mental Health (DMH) has become the Department of State Hospitals, curiously leaving out the word “mental” as these “State Hospitals” are mental hospitals. Hmmm….So, I learned the following…. Welcome to the New Department of State Hospitals! On December 7, 2011, the California Department of Mental Health announced the blueprint to establish the new Department of State Hospitals and reforms to the Department of Mental Health structure designed to improve the mental hospital system in California. Interesting. There is still the LA County Department of Mental Health, but the State Department of Mental Health has reorganized. State mental health services are now part of DHCS (Department of Health Care Services) and not it’s own department. I knew this change was coming, but I did not know the specifics, until this article reminded me to check it out! My impression is that this change is detrimental to mental health care, as mental health used to have it’s own budget and now it is part of the bigger health care budget. All of this will be important if the Affordable Care Act rolls out in January, 2014. With all of that, I repeat. Today, I am basking in the glow of my colleagues standing up for patient care.